Gatefold. Back cover with Polydor label logo on top left and "23 91 323 52" on top right. 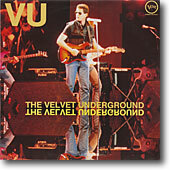 "Editado por POLYDOR, S.A. | Avda de America, s/n - Madrid ­27 | Impresso en Españ por FOCO, S.A. | Avda America, s/n - Madrid (1977)" printed inside the gatefold. Red Polydor label. Legal deposit M. 37193-1977. 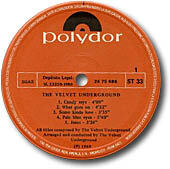 Edited by Polydor, manufactured by Cofasa. Reissue, edited by Fonogram, manufactured by Polygram Servicios. No gatefold. "Editado en Espana por FONOGRAM S.A. - Avda de America s/n, Madrid - 27". "Impreso en Espana por Graficas FOCO, S.A. Avda de America s/n, Madrid – 27 (1984)". Blue "Mas de 100 Artists en Super Stars Seris" inner sleeve. Red Polydor label. Legal deposit M.37193-1977. No gatefold cover with barcode. Red Polydor label. Legal deposit M.12366-1990. Edited by Polygram Iberica. Manufactured by Eurogram. Toy soldiers cover. Red label. Legal deposit M.36653-1977. 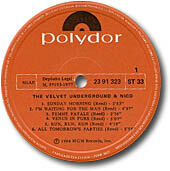 Edited by Polydor, manufactured by Cofasa. Also exists as musicasette. Toy soldiers laminated cover. Red label. Legal deposit M.23319-1980. Edited by Polydor, manufactured by Cofasa. Toy soldiers cover, background color is white yellowish, with white spot in the midle of the toys soldiers picture. "Super Stars Series" black letter inner sleeve with artist names. Red label. Legal deposit M. 36653-1977. Edited by Polydor, manufactured by Polygram Servicios. Toy soldiers laminated cover, background color is snow white, with white spot in the midle of the toys soldiers picture, more visible as compared with the alternate 1985 edition. "Super Stars Series" inner sleeve with album covers printed in blue. Red label slightly different - it has letter all around. Legal deposit M. 36653-1977. Edited by Polydor, manufactured by Polygram Servicios. Also exists as musicassette. Toy soldiers cover, background color is grey. Red label. Legal deposit M. 36653-1977. Edited by Polygram Iberica, manufactured by Eurogram. Red label. Legal deposit 23320-1980. Edited by Polydor. 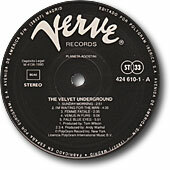 "Original Rock Classic" cover. Green/White/Orange Atlantic label. Legal deposit M.2972-1986. Edited by WEA Records, manufactured by Polygram Servicios, distributed by Ariola Eurodisc. Red Polydor label. Legal deposit M.19876-1974. Edited by Polydor. 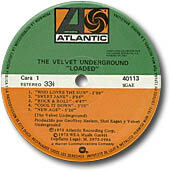 Censored edition of a compilation album which was also relesased in Germany, UK and Italy. The Spanish release is without Waiting For The Man, Lady Godiva's Operation and Heroin, but includes That's The Story Of My Life. Cover and label have Spanish translation of the song titles, next to original English titles. 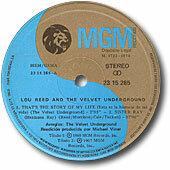 Blue/gold MGM label. Depósito Legal: M. 1722-1974. "FABR. POR COFASA, S.A.", "DISTR. POR POLYDOR, S.A.". Tucker is misspelled as "Tucken" in Sister Ray credits. Also exists as musicassette MGM 31 10 285. Side 1: 1. That's The Story Of My Life (2:05) / 2. Sister Ray (17:00). Side 2: 1. Sunday Morning (2:53) / 2. All Tomorrow's Parties (5:55) / 3. There She Goes Again (2:30) / 4. White Light/White Heat (2:44) / 5. Femme Fatale (2:35). Censored cover and record - no Heroin! 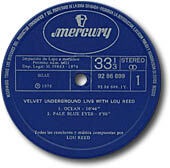 Blue Mercury label. Dep. Legal: M.39005-1976. "Fabricado en España por COFASA Av, América, s/n - Madrid - 17 Distribuido por Fonogram, S.A."
Side 1: 1. Sister Ray (17:00) / 2. Venus In Furs (5:07). Side 2: 1. European Son (7:40) / 2. Pale Blue Eyes (5:40) / 3. Black Angel's Death Song (3:10) / 4. Beginning To See The Light (4:48). Part of the "Gigantes Del Pop" series. Glossy cover. "Editado por POLYDOR, S.A. - Avda. América, s/n - Madrid - 27 - Impreso en España por FOCO, S.A. - Avda. América, s/n - Madrid (1981)". 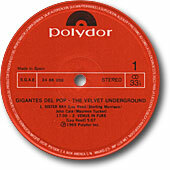 "Gigantes Del Pop" inner sleeve. Also exists as musicassette 31 86 042. Side A: 1. Sister Ray (17:00) / 2. 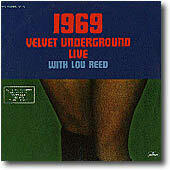 Venus In Furs (5:07). Side B: 1. European Son (7:40) / 2. Pale Blue Eyes (5:40) / 3. Black Angel's Death Song (3:10) / 4. Beginning To See The Light (4:48). 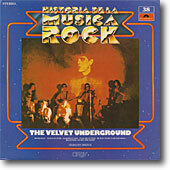 Part of the "Historia De La Musica Rock" series. 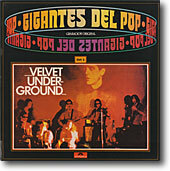 Same tracklist and matrix numbers as Gigantes Del Pop Vol. 5. 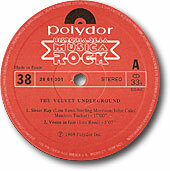 Red Polydor/Historia de la Music Rock label. 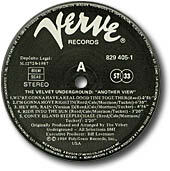 Black Verve label. Legal deposit M.5.287-1985. Edited by Polygram Iberica. Back cover same as German edition. 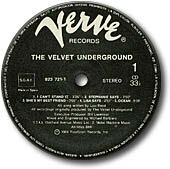 Black Verve label. Legal deposit M. 12728-1987. Edited by Polygram Iberica. Side A: 1. Sunday Morning (2:51) / 2. I'm Waiting For The Man (4:35) / 3. Femme Fatale (2:35) / 4. Venus In Furs (5:06) / 5. Pale Blue Eyes (5:51). Side B: 1. Heroin (7:06) / 2. All Tomorrow's Parties (5:54) / 3. White Light/White Heat (2:44) / 4. I'll Be Your Mirror (2:07). Compilation for Planeta Agostini, licensed from PolyGram International Music. Glossy cover. "Editado en España por POLYGRAM IBERICA, S.A. - Avda América, s/n - 28027 Madrid | Impreso en España por GRAFICAS FOCO, S.A. - San Romualdo, 26 - 28037 Madrid". Special thanks to Alfredo Garcia. Thanks: Alessandro Santamaria.